Third plate in the Carefree Days collection by artist Thorton Utz. 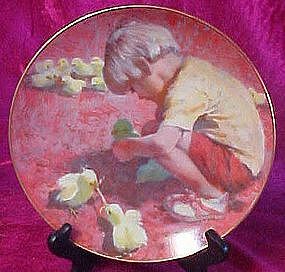 This plate is titled "Feeding time" and portrays a child feeding the baby chicks. Plate measures 8 1/2" in diameter and has real 24k gold edge trim. Made by Viletta China Company. This plate has been long retired and is in perfect condition. Original certificate of authenticity included and styro box..